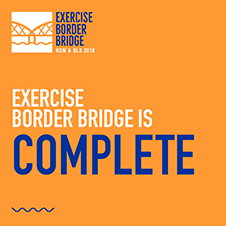 Exercise Border Bridge was held in March 2018 and was designed to test how New South Wales and Queensland respond to a biosecurity emergency affecting both states. Exercise Border Bridge was the largest simulated biosecurity exercise in a decade and involved more than 260 participants from New South Wales Department of Primary Industries, Biosecurity Queensland, the Australian Government Department of Agriculture and Water Resources, as well as Australian plant and livestock industries. The focus of the exercise was the use of legislation, IT systems and existing arrangements to respond to the biosecurity incident. Both NSW and QLD had recently introduced new biosecurity legislation so the exercise provided an opportunity to assess the implementation of legislation in a cross-border scenario. The scenario began with a simulated detection of Lumpy Skin Disease (LSD). LSD is an infectious disease of cattle and buffalo. A simulated plant pest Giant African Snail (GAS), commenced midway through the exercise to challenge participants with two very different emergencies at the same time. At regular intervals, new challenges and tasks were provided to the participants with the aim of reflecting how a real-life emergency situation would evolve. Evaluation teams collected and collated over 1400 observations during the exercise. These observations and insights were used to develop the Joint Exercise Report (the Report). The Report has been developed following extensive consultation and evaluation and has been reviewed by the jurisdictions involved in the exercise. Improve the overall management of large functional exercises. NSW DPI and Biosecurity Queensland are now looking at addressing these recommendations and incorporating the recommendations into improvement and reform programs already underway. The Report was released on 5 October 2018.